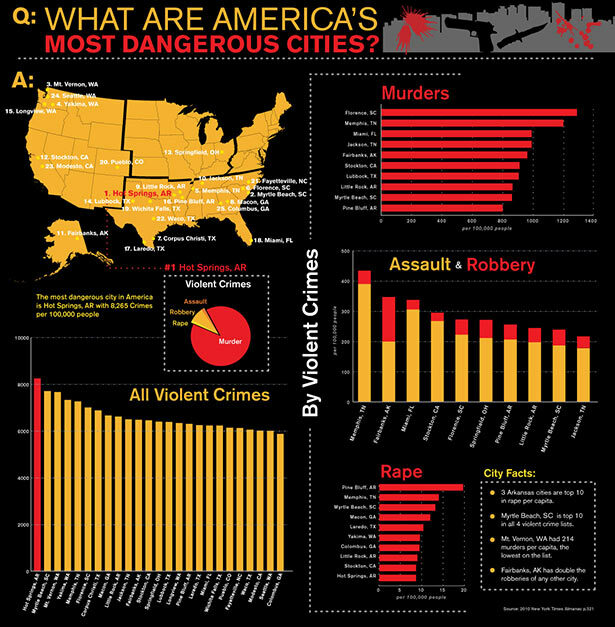 If one googles “What are America’s most dangerous cities,” some surprising information is found. The first post noted is from Forbes, which lists Detroit as the most dangerous. The second post is from chacha, which lists Hot Springs, Arkansas as the most dangerous city in America. Hot Springs? It is the city where I spend most of my time. Statewide T.V. news has confirmed the internet information in the past two weeks. Last night, it was reported that a group of men had been arrested for county crimes. This is after two other recent T.V. news stories; one the top story of the evening. They were about crime in Garland County. Sitting next to me is a stack of 8 ½ by 12 paper with information from the internet that contains unfavorable facts for Hot Springs. The information was given to me by a speaker who discussed it last Saturday at a local speech club. This information is not something that I want to make known. But, I can’t pretend a problem doesn’t exist. If the information gets to enough residents, maybe helpful changes can be made. I see the problems myself. Local church based assistance programs are stretched to the limit. In the past two years, clients at one free (to the client), faith-based assistance location have doubled. By now, most of you who read this blog know that I believe our problems stem from a spiritual need. We can address the surface, but until we address the heart, I think we will continue to see numbers that are unacceptable. Each individual must take responsibility for themselves and for their children. Until the Commandments of God return as an important part of personal and national law, we will continue to see problems. How can we not? A lawyer asked Jesus a question one day. “Teacher, which is the great commandment of the Law? This stack of paper at which I am looking would not exist if man would embrace the guidelines set out in the words of Jesus. The comments at the above site reflect views that one would get on the streets of Hot Springs. This entry was posted on Wednesday, July 28th, 2010 at 4:56 PM and is filed under Commentary, News. You can follow any responses to this entry through the RSS 2.0 feed. You can leave a response, or trackback from your own site. 2 Responses to THE MOST DANGEROUS CITY? Hot Springs is by far the Most Dangerous , most corrupt, small town In the USA. I have witnessed murders that were not reported in the newspaper. It’s a tourist town though so it is what it is. It’s also a tradition…look up Hot Springs Gunsmoke, written by a local law enforcement officer. It’s a very pretty town, and the park rangers do a great job and I really love to visit. Statistically, you appear to be correct on “dangerous.” There is no doubt in my mind about corruption, either. At the same time, It is a beautiful little place and I know many wonderful people who live here.